Chimpanzee Information: What's Wrong With The Laws In CT For The Innocent? Charla Nash's Life Is Ruined And Sandra Gets Off All Charges? What's Wrong With The Laws In CT For The Innocent? Charla Nash's Life Is Ruined And Sandra Gets Off All Charges? My only hope is that Charla will remember the phone call, I don't wish that whole tragic nightmare to come to her, but at least why she went over there, then her lawyers do something to the state, because they are the ones, in my opinion that lay fault on this situation. If the authorities had done their job properly when Travis got out of the vehicle, held up traffic for hours, many police officers were there, then Travis would have been place in a good sanctuary still alive, and Charla Nash would not even be in the news. What's wrong with that woman? (ChattahBox)—Charla Nash, 56, woke up on Monday, Feb. 16 like any other day, completely unaware that her life was about to change forever. 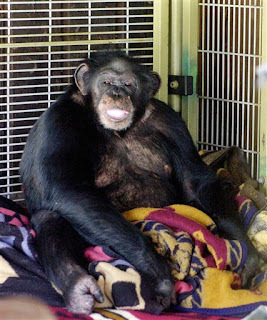 Her long-time friend and employer, Sandra Herold, 71, phoned Nash to help her move Herold’s 200 pound pet chimpanzee back into her house. When Nash arrived, the 14-year old chimp named Travis, went berserk and savagely mauled Nash. Despite the horrific nature of the attack and the lack of a permit to keep the animal, David Cohen the State’s Attorney for Connecticut, will not be pressing criminal charges against Herold for recklessness. The chimp was also given Xanax before Nash arrived, but there was no evidence that the drug contributed to the attack. “Although Xanax was detected, it is impossible to state whether that had any effect and, if so, what,” Cohen said. “It is therefore my determination based on the evidence presented at this time that no criminal prosecution is warranted in this case,” Cohen said. “This doesn’t in any way minimize the horror that we all feel with what occurred and the horrendous injuries suffered by Ms. Nash,” said Cohen during his press conference in North Stamford today. Nash’s family is suing Herold for $50 million and plans to sue the state for $150 million. Charles Willinger, an attorney for the victim’s family said Nash was at peace with the decision not to file criminal charges. Nash remains in the Cleveland Clinic in Ohio recovering from her severe injuries. The chimpanzee tore off her hands, eyelids, lips and nose. Nash is blind and suffers from brain damage. She has no memory of the attack. The police shot and killed Travis the chimp when they arrived on the scene. She appeared on “The Oprah Winfrey Show” last month, allowing the world a glimpse of her mauled face.